My husband and my brother-in-law made this really delicious and healthy meal. My brother-in-law loves to experiment with food and his cooking and presentation skills are amazing. This was supposed to be a boys night meal. Not bad. Beats the usual take-away’s that guys are prone to ordering when they get together! 1. Cut the chicken fillets into strips. 2. Mix olive oil, turmeric, paprika, ground fennel, ground coriander, grated ginger, minced garlic, salt and pepper in bowl and add chicken. 3. Cover bowl in clingfilm and leave to chill in the fridge for a few hours (the longer the better)! 4. When ready to eat, heat pan and cook chicken until cooked through and golden brown. 5. Heat pitta breads on the pan, split and fill. 1. Peel and quarter the sweet potato and put in pan filled with water and boil for 20 minutes. 2. Once potatoes are soft and oiled through drain water. 3. Add butter to milk in a pan and heat gently until the butter has melted. 4. Add sweet potato to the mixture and mash with a potato masher until smooth and fluffy. Serve with a side of salad leaves and dress with French dressing! 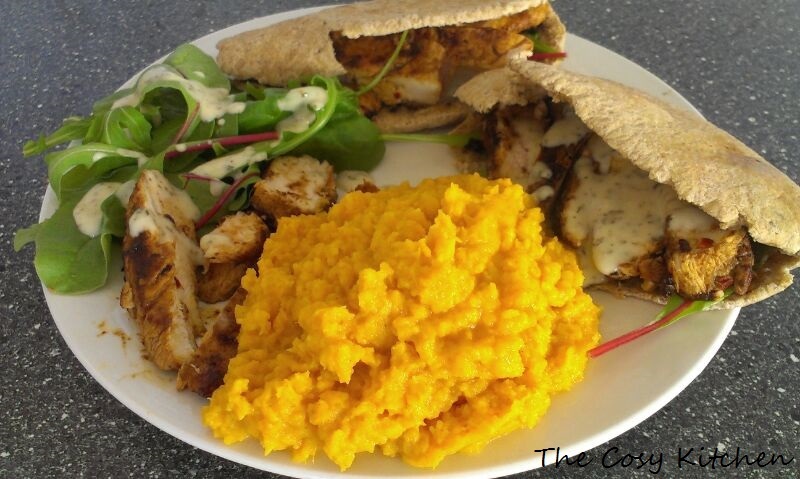 I love sweet potato mash, that looks wonderful! Some really lovely spices! 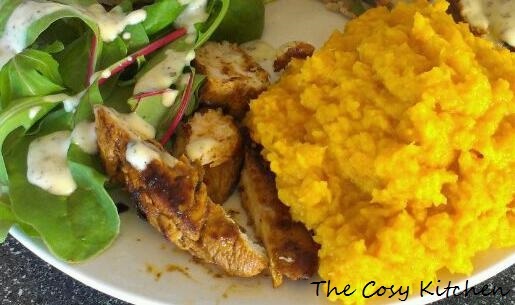 I love the sweet potato mash; I’ll definitely be trying this one. Thank you! I love my food spicy! Let me know how it goes, potato is such a versatile ingredient and it always tastes good no matter what you do to it!